Beweb is a web technology company with a team of ten web developers and project managers in central Auckland, New Zealand (NZ) with a passion for making stuff work for our customers. We design and develop custom web-based technology solutions for New Zealand and international clients. Submit your own message to brighten up other people's day! 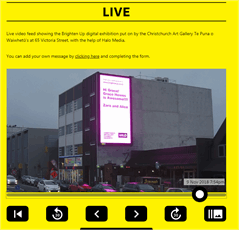 Beweb developed the website that lets anyone share a message on this giant billboard as part of the Brighten Up digital exhibition put on by the Christchurch Art Gallery Te Puna o Waiwhetū at 65 Victoria Street, with the help of Halo Media. The guys at Beweb interpreted the brief with amazing accuracy, coming up with solutions which I didn’t know I needed but they knew I wouldn’t be able to live without. That summed up the whole experience; they were one-step ahead of my needs throughout the whole project.